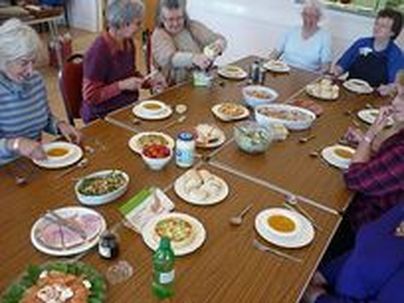 A lovely sunny day in Waverton, and excellent lunch and yet another successful day for finishing off those bits and pieces. 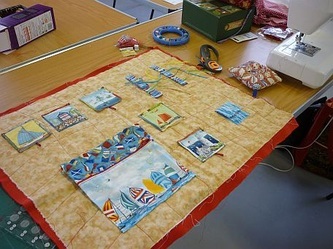 projects including Adult Activity Mats with Barbara Harrison. Another succesful day with the traditional shared lunch! There is always more than enough food and an amazing variety - I wonder if one day we will have all savoury dishes or even better just all puds! Jane Dawson from Chester Mystery Plays production team kindly came and gave us a very coulourful and interesting 30 minute presentation about the forthcoming plays which will hopefully give our members inspiration for work for the Cathedral exhibition next year. 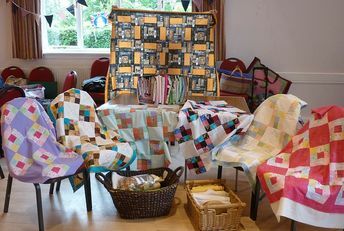 We celebrated Annual Quilting Day. 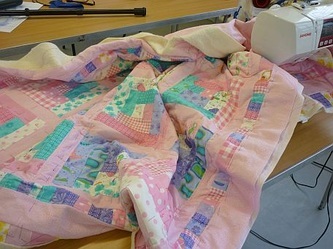 Some members worked on Linus quilts and others brought their own sewing to work on. These events are very relaxing with excellent bring and share lunch.